You have been blessed with some inherent core values as a part and parcel of your taking birth. 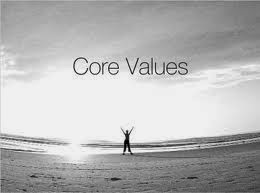 Truth, Honesty, Discipline, Helping others, contribution of your value add...whatever be it..you must spend time analyzing what your core values are, and then strive to live by your values. It is important to identify them, because these values show you the much needed direction in life. Your core values should determine your mission in life, because if your mission (which ultimately determines your actions in day to day life) are driven by your own core values, nothing else can keep you happier. You are poised to live a stress free, happy life. Do not get into a profession which goes against your core values, even if the remuneration seems handsome in the beginning. I know of a friend who became a lawyer out of the fact that everyone in his family was a lawyer, and therefore it made lot of sense and synergy to build his profession in the same area. He was never happy, because very soon he realized that honesty was his core value, and it is difficult to keep himself happy at the core even if he succeeds professionally in the law field. I, myself, went into a profession which required marketing of Electrical switchgear with one of the largest electrical switchgear companies in India. It seemed such an obvious choice because i was getting the best company through campus and i was an electrical engineer. I never thought og checking what marketing of electrical switchgear would actually entail and whether i am shaped in a way to do the same. Very soon, i realized that my inner core circuit was not aligned to marketing, sales, outstanding payments collection, camping at the client premises etc, and i was doing this just for earning money. I was fortunate to have been able to grab an opportunity to change my direction to do something that was more aligned to my core values. As i get to know myself deeper, i am further aligning my direction of life in sync with my core values. It seems an ongoing process which is moving forward as i get to know more about myself. It takes time to understand yourself and your core values. You need to take a pause, stop and think, spend time with yourself, look at your inherent value base and then compare it with what you do for the most part of your life. If these two are not aligned, you need to change the latter. Changing your values can be a tough ask, but changing your career or goals and bringing them in sync with your values is what you can definitely attempt to do. Here is the best part of living your core values. When you are living and working as per your core values, you don't need to please anyone to feel happy. Just the act of what you are doing will give you enough happiness, not to desire anything from outside. What can be more satisfying than that. You will never feel lack of willpower, confidence and courage to tread your own path when it is directed by your value system. Going against the direction shown by your values is like walking against the gust of wind. You will soon get tired, exhausted and worn out, even without covering enough distance. Come in harmony with your core values, and lead a simpler, happier life. Read more about your core values and how your everyday happiness is linked to it. You are entitled to happiness unlimited !! Where is the compass of your life?